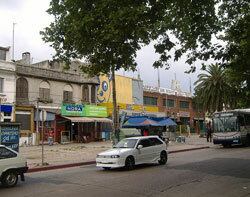 The residential area of Brazo Oriental is situated 12 minutes from Montevideo’s city centre. It is further subdivided into smaller neighborhoods, including Reducto, La Figurita, Jacinto Vera, Bolívar, Atahualpa, Aires Purros, and Cerrito de la Victoria. Sites of interest in Brazo Oriental are the Museo de la Casa de Luis Alberto de Herrera (in tribute to the late Partido Nacional leader), the Escuela Superior de Comercio of the Universidad del Trabajo del Uruguay, and the headquarters of the sports club, Colón F.C.